The French shipyard, Couach has unveiled its new 30 metre "3000 Fly Yacht" model which is capable of reaching an impressive speed of 34 knots, thanks to its 2.400 HP engines with a relatively low fuel consumption. A good overall match between the propulsion system and hull design explains the result attained. In fact, at cruising speed the Couach "3000 Fly Yacht," can cover distances of over 1,000 nautical miles. To achieve this performance, the shipyard's designing team worked on the hull evolution of the popular "Long Range 2.800" renowned for its cruising abilities, by fine-tuning the positioning of the shaft tunnel and the exhaust system. The design is typical of the modern and sporty Couach style with its sleek lines and extensive window panels running along the sides. One of two different layouts may be chosen for the interiors. 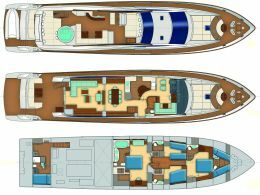 The first foresees four cabins below deck: the owner's master cabin running full beam a-midships, another with twin berths and two further "VIP" cabins. The second option offers in place of the owner's master cabin, two double berth suites for a total of five cabins. In both cases the crew's quarters are at the extreme ends of the yacht. The bows in fact hosts a cabin with two bunk berths and a bathroom whilst the Captain enjoys a "queen size" berth in his own cabin and bathroom at the stern. The common areas do not vary in both versions. At main deck level, moving from the bows towards the stern, there is a wheelhouse with its built in area in which to relax, a galley, a closet, mess area and main saloon. There is a comfortable saloon in the cockpit outside, and a large sunbathing facility with sun pads forwards as well as another dining area. The "flying bridge," aside from hosting a double set of commands for the yacht's manoeuvres, has a circular Jacuzzi, a range of sun pads for the benefit of the sun lovers on board, and a saloon with bar. For further information please contact: Couach; Rue de l'Yser, 33470 Gujan-Mestras, France. Tel. +33 (0) 556 223550. Fax +33 (0) 556 660820. Web page: www.couach.com; e mail info@couach.com. Declared top speed: 34 knots.